Preparing to take the CFA exam is a daunting challenge. 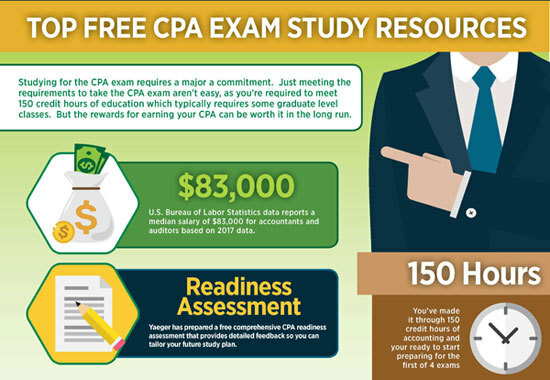 One of the most effective study tools is to use a CFA exam prep program from one of the many providers. Today we examine the Kaplan Schweser CFA exam prep program and provide a first hand review of the program. The best way to find out if Schweser is right for you is to try the course for yourself. Also see our Guide to the Best CFA Exam Review Courses. How Close Are Kaplan Schweser Questions to the Real Exam? The big question you should have is how to prepare to make sure that you pass on the first try. It is estimated that the total time needed to cover each level of the curriculum is around 600 hours, and you definitely don’t want to invest 600 hours into a failing idea. Just think what other skills you could develop in that amount of time, or how much you could grow your professional network if you were strategic about it. I assume you have considered the opportunity cost and still decided to pursue the Charter. I would say it is essential to create a plan that will ensure you do have enough time to prepare without destroying your family relationships, your health, or your interest in the field. Plan to spend 600 studying, whether you only use the official curriculum, or an additional test prep provider. Start as early as possible (7 to 9-month plan sounds reasonable), and aim to be done about a month before the exam, so that you can spend the last month reviewing your notes, catching up on sleep, and doing a 3-hour long sample exam or an equal amount of SchweserPro QBank questions, twice a week. Before I go in-depth describing my preparation experience, there are a few pieces of advice that would help any CFA exam test taker, especially a Level 1 test taker who is new to the routine. The thing that will frustrate and cause serious self-doubt, will be studying a chapter, not revisiting it soon enough, letting it fade in the memory. Next time you open that chapter, it’s a new world. It is very frustrating having to study it all over again. With the curriculum being as broad as it is for Level 1, it is hard to keep it in your head all at once unless you review it a lot. You may feel like running in circles, you might feel anxious and even question if you are good enough, fast enough, smart enough, to get everything prepared on time. Don’t let it happen. After you have studied a chapter, assign yourself revision tasks for the next few days and the week after, to make sure it sinks in your memory. Do not check off a chapter as ‘complete’ until you are confident you know it. A topic may take several days to go through, and after reading it you may still not feel like you understand it completely. In that case, study something else, but keep coming back to this hard topic, until you feel good about it and you can solve all the end-of-chapter questions, or most of the related questions from SchweserPro QBank. Let me make a note about Kaplan study calendar. While well intended, I didn’t find it very useful. I recommend making 2 calendars of your own that are both helpful. One is a high-level calendar, and the other is a micromanaging calendar. For the high-level calendar, print out a new sheet for each month from outlook or find a grid online. Buy a few thin adhesive strips of 6 different colors corresponding to 6 sections of the book, and assign them to the calendar all the way to the exam date. Write on each, which chapter you are studying that day, and make sure you have made provisions for review of the chapter by placing same-color strips at some points in the following week. You can adjust this study plan easily by moving strips around and you will be able to see if some days have too much or too little study allocated to them. This type of calendar worked really well for me for all three levels. 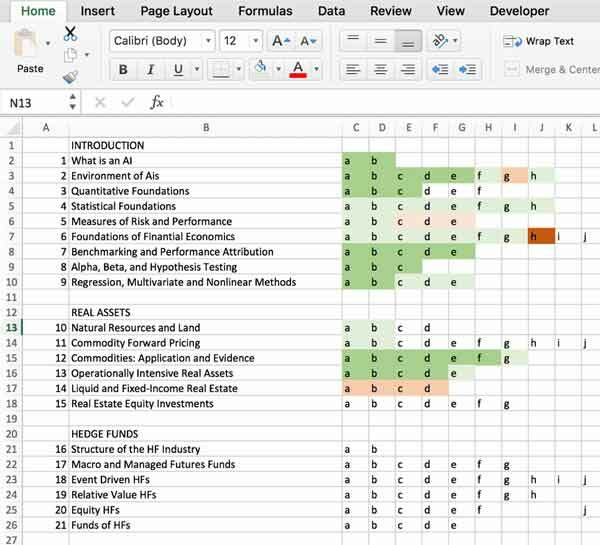 For the micro calendar, create an Excel spreadsheet, with all chapter names listed vertically in rows, and the Learning Outcome Statements (“LOS”) for each chapter listed horizontally in columns (a, b, c…to however many LOS the chapter has). When you study each chapter, fill in respective LOS cell with a color ranging from red (as in “clueless”) through pale reds and pale greens (for “lukewarm understanding”) to dark green (as in “mastered”). As you revise the chapters and make progress, change the colors from reds to greens. Here is an example of a study plan I used for a different prep course. How I kept track of which topics I knew best and which topics I needed to spend more time studying. Using both calendars allowed me to avoid studying the same material twice, only re-reading the LOS that needed work, and knowing exactly how much of the whole curriculum and of a particular section I know. I highly recommend keeping a similar plan when you study. While some of you will only use the official textbooks, if time and money allows, I would strongly recommend using an additional prep provider. Kaplan Schweser is very popular option, highly recommended by students on dedicated message boards like analystforum. I used Kaplan Schweser for Level 1, and I did pass the test on my first try. This package costs $1,349.10 and offers a live weekly class, on-demand videos, study notes, an exam review (3 or 5 days) close to the exam date, question bank, and 6 practice exams. This package costs $989.10 and offers an online or a live (add $270) weekly class, on-demand videos, study notes, and question bank and 6 practice exams. It does not include an exam review close to the exam date. The live online weekly class is likely a good option for students who are new to the material. 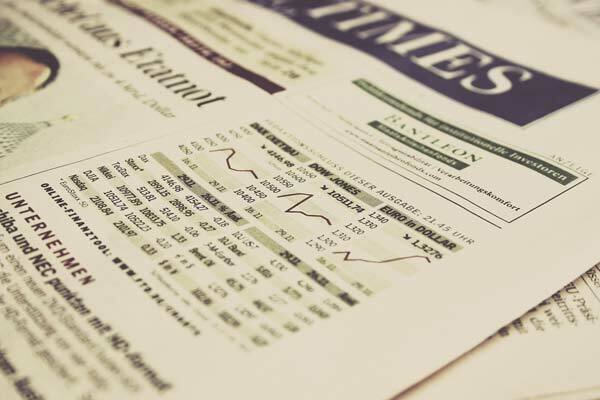 However, neither the class, nor the video lecture series will cover all the details of the curriculum, and you should plan to also read the Schweser Notes or the official CFA Institute curriculum for each topic. A few words about the exam review included in the Premium Plus package but not Premium Package. Looking at the price difference, I will assume the review course is valued at $360 for 3 days and $630 for a 5-day option. I am sure all the various materials included in both packages will add to your preparation, but I have yet to meet a test taker who passed, and who attributed his passing to a review course a few days before the exam. The curriculum is broad and detailed, and if you don’t know your stuff by about a month in advance, there is no review course out there that will get you over the finishing line. Having said that, if you are a student of the worrying variety, absolutely go for the first package. A review course will boost your confidence, and 6 sample exams will tire you enough to calm the nerves, and you will do great. This package costs $649 and includes the question bank, 6 practice exams and study notes. This is the package I used, since it was affordable, yet included the Schweser Pro QBank. From my experience, this is a sufficient package for a self-starter who is comfortable with learning by reading and doing practice problems on their own. The question bank is extremely useful. It is perhaps my favorite product among all of Kaplan offerings. You will be surprised how many holes those questions will poke in your knowledge of the material, and how quickly you will learn by actively applying what you’d read about. The question bank allows you design your own quizzes by including multiple chapters, and my advice here is after working on a particular chapter, test yourself by including all the past chapters. This will keep material fresh in your head and will avoid re-reading hundreds of pages. This package costs $379 and contains study notes and 3 practice exams. The study notes are included in each of the study packages. This is Kaplan’s version of the official CFA Institute curriculum, written in a slightly condensed form and slightly less technical language. I did try studying some of the material using Schweser Notes when the curriculum looked too long or when I didn’t understand a certain explanation. As for my preference, it depends. I have had a few instances (and heard of other people having the same experience), when Schweser Notes did not cover all the CFA material, which made it impossible to answer some of the end-of-chapter questions in the official books. Imagine, you spent 10 hours studying, only to find out you can’t answer the questions. Now you need to spend several more hours looking for the sentence that addresses the detail you need. According to some test takers, you can pass even if you skip a few questions, but I would rather minimize the unknowns. My suggestion is, read the official books, refer to Kaplan when stuck, and do end-of-chapter questions from both sets of books. A special note should be made about the Ethics section. I have heard time and time again that ethics should be studied using the official books, and all examples must be studied thoroughly. Answer options should not seem ambiguous to you, if they are, you have not studied the section thoroughly. I would say they are slightly easier than the actual exam. On the other hand, a large quantity of the Schweser Pro QBank questions are equivalent to the actual exam. The important thing to note is you need to solve a lot of questions, at least 70% of the questions offered in the QBank for each chapter. You should feel like every problem in the question bank is straightforward and you know how to solve it. It will take a lot of your time to go through the question bank, but it will be time well spent. I highly recommend purchasing a package the includes the Schweser Pro QBank. It was my favorite part about the Kaplan program, a fun and effective way to learn the material. Before we wrap up, a few more suggestions on making the best of your prep time. Use flash cards, especially for formulas, but make them yourself. Practice quickly writing them down from memory, read them out loud without looking at your notes, teach them to somebody else. That will help you memorize them better. Make a binder with a 60-something pages that correspond to the chapters of the curriculum, and write condensed notes for each. Re-write them as you run out of room on the page. Re-write them again after you have firmly memorized some of it and don’t need to waste space on it, or as you find ways to summarize the information better. Schweser does offer a Quick Sheet with every package, which is a summary of formulas and definitions, but your notes are going to be much better, more exhaustive, and custom tailored to you. Carry them with you and review them often. Reflect on your studying. If you don’t like lecture videos, don’t use them. If you find yourself getting distracted, change your surroundings. Don’t do more of what isn’t working. As needed, ask for help, get sleep, go to the gym, and try again. One thing to remember is, if you really want the Charter, nothing will stop you. This will be one of your career’s biggest efforts, but also one of your biggest professional accomplishments. Very few finance professionals take on the challenge to pursue the CFA designation. Be proud of your decision to hold yourself to a higher standard. I wish you perseverance, composure, vision, and the best of luck on the test day!